Ideal for home and office. Time to give your hard-working feet the comfort they require. and please send my best regards to your wonderful artisans too. 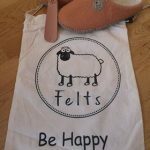 Hi Felts, I just received the shoes today, and can’t be happier!! 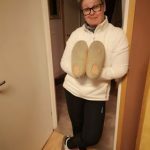 :) My cream shoes are super lovely, warm and comfortable, and my husband’s charcoal is an amazing color with a great quality, he really loves them. My MIL’s peach looks very nice, too. (It’ll be given as a present).These shoes are the top quality with some personal touch, and I am very honoured to be a part of this from the very early stage and please send my best regards to your wonderful artisans too. I am so pleased with Felts. My feet are really happy! Also, I am so happy to have found my gift to give to all my loved ones from here on. My precious pair, I have worn Felts in office for eight months, eight hours a day, five days a week, beautiful, best shoes possible for my feet. My home pair is as much loved. Can't wait for the outside version. Life-changing, Thank you Felts team. The Best Shoes Evah. Lightweight, Comfortable, always the Right Temperature. The hand-stitching is perfection, sturdy and beautiful to behold.